Our feisty little Mom and Grandmother quietly passed from this earth on January 22, with her family at her bedside. She lived her life by always “checking in” and being present in word and deed for all her cherished family and friends. All who knew her loved her. Her very name “Oma” is the German word for granny, and she was granny to not only her own grandchildren, but to countless others along the way. Oma Gena Burgess was born in Baker Springs, Arkansas on September 30, 1921. She grew up on a farm with six brothers and sisters during the great depression. She married Ralph Sims and they had three daughters before moving to California during the WWll years. Daughter number four was born there. Oma worked as a nurse at Harbor General Hospital during the war. At the end of the 50’s the family moved to Wenatchee, WA. She worked at the Eye and Ear Clinic for 32 years until her retirement in March of 1990. She traveled and enjoyed her leisure life for several years, and then ultimately, because many of her travels took her to be with her children in the Seattle area, she decided to move there. Her final home was in Bothell, WA where she lived a busy life close to her daughters and her grandchildren. 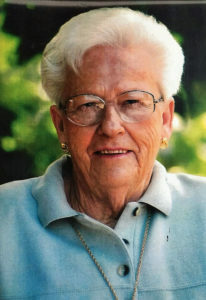 She continued to travel whenever possible and spent many summers in Ogden, Utah or New Mexico with her family. She was widowed early in her life. Ralph passed away in 1968 and she never remarried. Although “on her own” for fifty years, she was never without friends, family or adventures. The adventures are too many to mention but will live in our hearts forever. Although she told us explicitly not to be “sitting around crying with long sad faces” we have failed miserably. The hole in our hearts is huge and we will never be the same. The world was lucky to have been blessed with her presence for 97 years and four months. She is survived by 3 daughters: Ozella Brunner (widowed), Joanne McDaniel (Donald) both of Bothell, WA, and Juanita Kosoff (David) Ogden, Utah. One daughter, Betty McGaha (Ron) passed away in 2005. She also leaves behind her five dear grandsons and eight precious great-grandchildren. At her request, there will be no formal funeral. A celebration of life is being planned in the spring. Its the end of an era. There will never be another Granny Sims. We will miss the daily phone calls (when the phone would work!) We will miss the stories, the great southern sayings, and all bacon, butter and sugar that was necessary to cook with every day. We teased about all of it, while loving every bit of it. Our mom had a spirit like no other. The people she leaves behind will always know they were loved and cared for in a very special way. I loved meeting your Mom and having good conversations with her. I have good memories of her in the short time I knew her. She will be very missed. She did love an adventure. Hugs to you and all your family and friends that are missing Oma. She was the BEST Granny and Friend to me! As an outlaw: meaning “Granddaughter in-law” she treated me as one of her own. She worried and checked in often. We shared MANY funny memories from the Cast Iron skillet she handed me 35 years ago to “cook the boys some eggs in”, to the 3 days before her passing and the sign I made on a whoopee cushion “Old Fart” for a birthday gift. We had many laughs and adventures for “therapy”!! My life has been blessed by her friendship!! RIP Granny!! Everyone’s Granny, everyone’s shepherd. Granny spent her entire life overcoming life’s difficulties. The Great Depression, loss of a brother in WWII, widowed at an early age and left alone to raise a child, the loss of a child. Through all of this she maintained a positive attitude and set an example for all who knew her. I was blessed to have her there to guide me through difficult times. I will miss her “Check Ins”. We miss this extraordinary matriarch of our neighborhood family SO much. She treated us like her own. We will carry many many memories of her feisty spirit with us for years to come. The genuine concern she showed to us during happy or sad times was from the heart and we feel honored to have been blessed to call her friend for almost 30 years RIP Oma You are in our hearts forever.